Suprised no one has mentioned this George Cole classic, excellent performance from the great man. Goats and monkeys ! I missed this show first time around and remember at the time that my father watched it religiously and always said it was good. A few years ago out of interest, I bought the Central VHS boxset and sat down to watch it. I have to say, I was quite disappointed with it, I didn't find it particularly funny and was dropping off - there seemed to be no real direction apart from Henry Root showing himself up as the most non-EU person one could ever meet. Perhaps it hasn't aged very well, as 1992 was the big talking point at the time and this has now passed the themes in the show aren't as current as they were then. Either way, I was disappointed with it and turned off after they got to Brussels out of sheer lack of interest in the programme. I am sure at the time, watching 1 week to the next it must have been better though. Perhaps am I might find myself on my own by not adopting this series as a classic. Would be nice to hear others' opinions though! Sorry admin, I have to disagree. 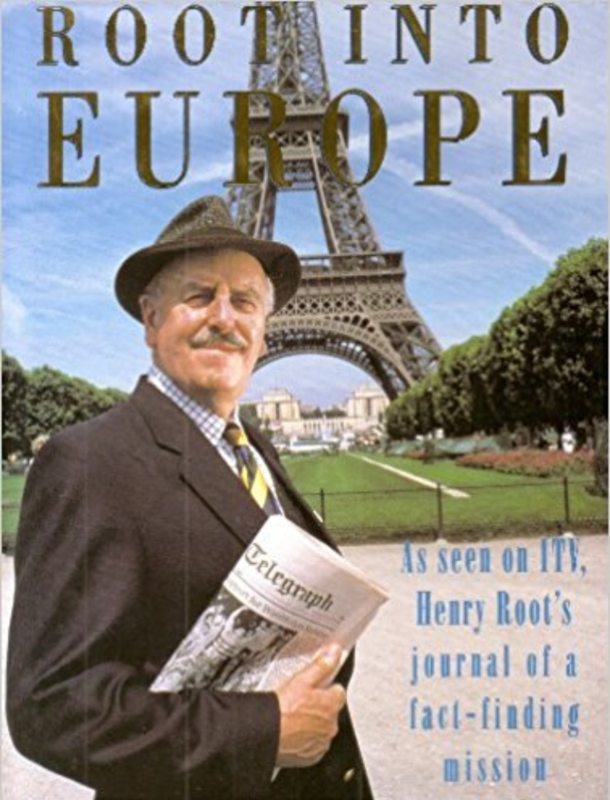 I loved 'Root into Europe', both the TV programme and the book; 'The Henry Root Letters'. As a commited Euro-sceptic it really struck a cord with me, even though it was actually satirising the euro-sceptic. I think George puts in his usual high performance and Pat Heywood as Mrs Root was excellent. It was a very original, ambitious and well executed series, with a great script and wonderful performances, strangely under-rated and forgotten today. I'm surprised you didn't like it admin, as it's basically Arthur Daly abroad, with a bit of politics thrown in. No, not sausages, Billy. Ears!" I remember watching it on TV when it came out and I didn't like it, but to be fair I was only about 13 and although I liked Minder as did my friends at the time (they still do) probably for a 13 year old it may have been a little to political I have one episode on video i'll dig it out and give it a listen. I haven't seen Root into Europe since it was first aired. As far as I can remember it was never repeated on ITV. I was only 15 at the time but I vividly remember enjoying the series. 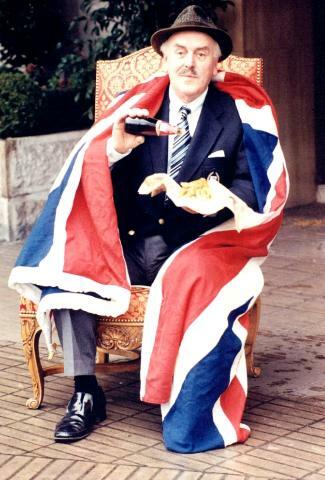 There were a few similarities with the Arthur Daley character, not least the somewhat 'patriotic' outlook and the Jaguar. If my memory serves me correctly, Arthur, I mean Root, took a suitcase full of All Bran abroad with him. When my grandad went on holiday to France a year after Root was screened he also took his own cereal with him! He had never seen the show but at the time it caused a lot of amusement. Of course compared to Minder, Root probably wouldnt be that strong but I do have some fond memories of the show. Whether I would rate the show if I saw it again is debatable, I tend to find I either enjoy programmes much more years after or much less - memories do not always seem that reliable and of course in my opinion the general standard of TV has plummeted (too much reality TV and I have to say I share Dennis Waterman's opinion of Little Britain and Eastenders!) 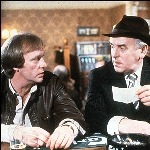 so if anything, Minder gets better and better as the years go by. When I watch contemporary dramas I often think mmm, how likely is it that I will be watching them on DVD over and over again in 15 years time! That's the great thing about Minder, I have seen all 107 several times but even after several viewings the show always brings a huge smile to my face. several times but even after several viewings the show always brings a huge smile to my face. Does anyone know where I can get a copy of this series. Very expensive to buy on Amazon and would love to gethold of a copy. I know it hasn't been released on DVD but am wondering if anyone has transferred it from tape successfuly and would be willing to make me a copy. I will of course be willing to pay for it. Look forward to hearing from anyone that can help. I've got to say I didn't think much to it. George Cole was as good as always but the programme didn't appeal to me. 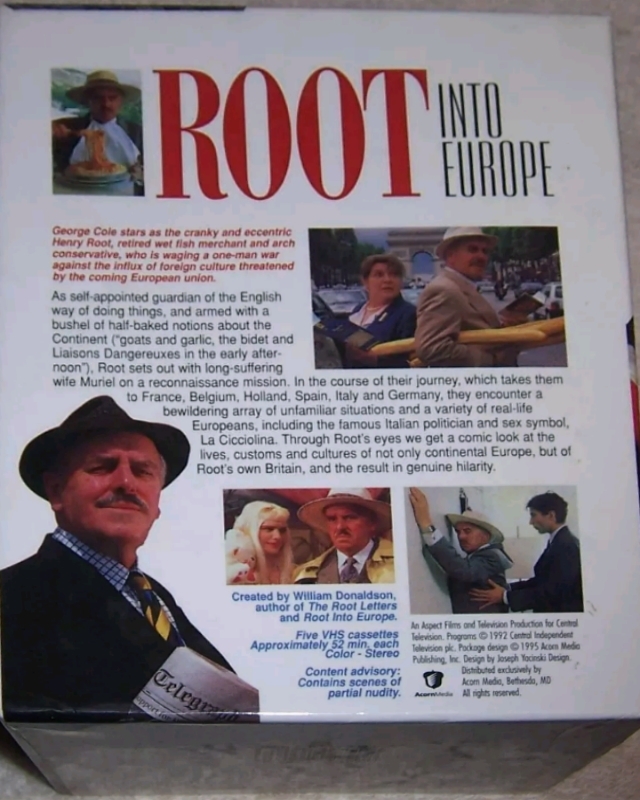 George Cole stars as the notorious man of letters, Henry Root, in Central's new five part comedy drama series for ITV, Root Into Europe. Starting on Sunday 17 May, Root Into Europe sees the much loved character from William Donaldson's best selling books, off on another harebrained scheme. The man who duped the establishment with letters outlining outrageous complaints and fanciful proposals, now invades Europe stopping off in France, Belgium, Spain, Italy, Germany and Holland. But for eccentric Englishman and ex wet fish merchant Henry Root, this is no holiday. This is a mission! 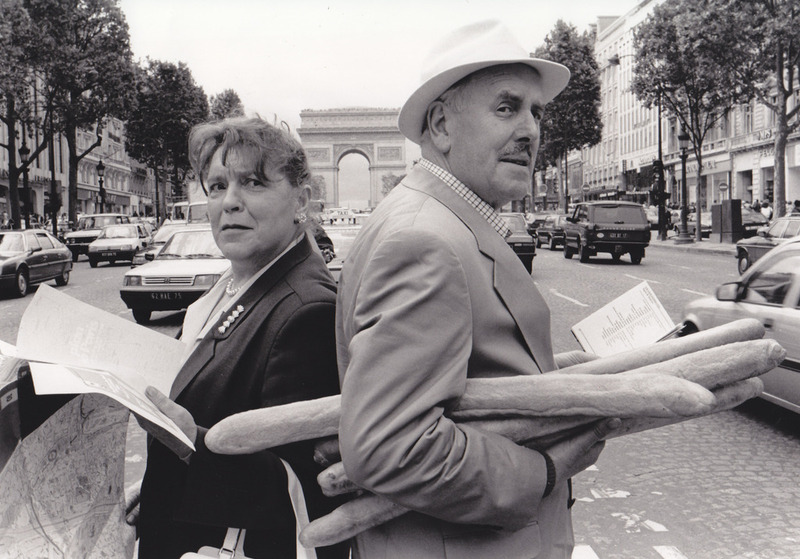 Picture: "I think we're somewhere in Paris Mrs Root". Pat Heywood as Mrs Root and George Cole as Henry Root. I watched this again recently. The locations and GC are a treat as always and there is a bit of banter between Mr & Mrs Root, but unfortunately I still stick to my original 2005 post above - laughs are very few and far between if at all. To even try and pass this off as a 'comedy', is stretching the definition of the term for me. It simply portrays an inept, super proud flag waving Englishman with zero knowledge of anything foreign at all, travelling around Europe embarrassing himself at each stage to the point of cringeworthy. GC plays the character to perfection but sadly I just didn't find it funny at all. For me it just highlighted how little some people know about their foreign neighbours and did so over too long a production. The joke here is Henry Root himself, but to repeatedly highlight this over several episodes is simply flogging a dead horse (which ok, might be funny to begin with, but the record needs changing). A colleague of mine told me he thought 'The Henry Root letters' on which this was based mildly humorous but I have not read that. I have a feeling this might have worked better in a book than on film. 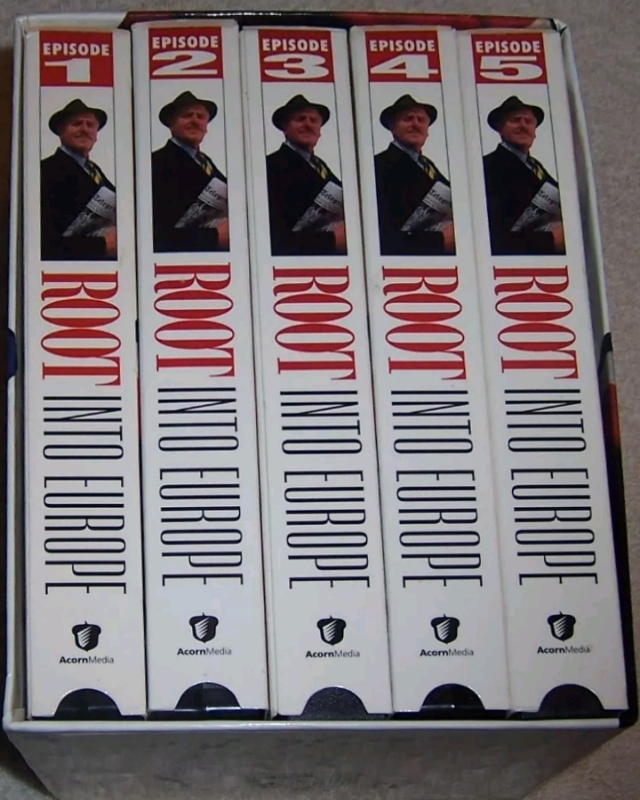 'Root in Europe' is a cringeworthy boring mockumentary for me, that does nothing backfire on the main character. I have never watched any of this and was always slightly suspicious of it. I thought the original Henry Root letters were hilarious, and still do, but I could not see how that idea could be transferred to a series like this. The basic premise of the letters was that they were so obviously a wind up by someone who wrote to celebrities/political figures saying the most outrageous things which, in most cases, they responded to taking the letters at face value. To try and create a film character out of the letter writer always struck me as a step way beyond belief, and possibly the work of someone who didn't really understand the letters in the first place. I suppose each person would find the letters either funny or totally unfunny, it is the sort of stuff that depends on the individual. But to me they were a way of puncturing the pomposity of a lot of public figures who were very slow to realise they were being sent up. You couldn't do that today because communication has changed so much, celebrities are more insulated from the public and the availability of google means no one would respond before checking if there really was a wet fish salesman called Henry Root. Great promotional shot of GC with tash. I'm with gustav on this. I liked the books but didn't reckon much to the series. Nothing wrong with George Cole's performance - I just felt the humour didn't translate to the screen very well. I think this is a cult classic. Probably because of the early 90s setting, the locations and the wonderful performance by George Cole (and Pat Heywood as his wife). I especially liked the bit in the German bath house. Also George Cole and Cicciolina appear on screen together! The Henry Root character is a bit far fetched, but it is a satire and the series is slightly surreal. It reminds me a bit of John Shuttleworth 500 Bus Stops. I have not read the books but they sound quite good. The author was a bit eccentric, so I have read. Around this time there were many comedies which mentioned the introduction of the single market in 1992 - including the rebooted Minder.